The Hamburg based material handlings equipment company will lift the lid on a completely re-designed batch of Internal Combustion (IC) engine powered forklift trucks before a world audience at international intralogistics fair, CeMAT 2014. Jungheinrich will unveil new generation IC forklifts to a world audience at international intralogistics trade fair CeMAT in May 2014. The fair is scheduled to run from May 19 to 23 in Hanover, Germany. 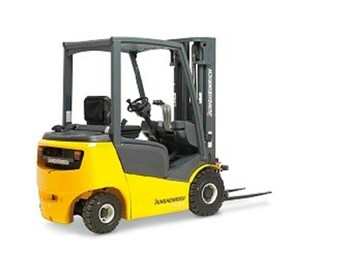 In May 2014, Jungheinrich will simultaneously launch two new IC engine powered counterbalance forklift series – hydrodynamic torque converter drive trucks in the DFG/TFG 316-320 and DFG/TFG 425-435 model ranges. The new generation of trucks can handle payloads of up to 3500kg with maximum stacking height of 7.50 metres. Kubota engines power the new forklifts, manufactured at the Moosburg production plant in the German state of Bavaria. Jungheinrich IC Powered Counterbalanced Trucks Head of Product Management Marek Scheithauer says the industrial engines have been tried and tested around the world in heavy-duty construction machinery and already deliver high torque at low revs. He adds the need for trucks that can operate in harsh operating environments inspired Jungehinrrich to apply the latest in-house engineering developments to the new torque converter’s core components such as the mast, chassis and steering axle. The result, Jungheinrich says, are robust trucks boasting high-grade, extremely durable, long-lifetime components that are ideally suited for extreme, tough operations in different climate zones. Scheithauer adds the counterweight on the new stacker is an integral part of the load-bearing chassis while the steering axle was integrated in the counterweight. "The centre of gravity is not only extremely low but also optimally positioned between the axles," he says. The result, according to Scheithauer, is outstanding stability. The Jungheinrich transmission shaft in the new torque converter features an integrated non-wear wet multi-disc brake. Scheithauer says compared with standard drum brakes, wet multi-disc brakes carries almost no service costs. The cooling system functions fully even in very hot ambient temperatures and the radiator is a single unit made of 100 per cent aluminium, making operation in hot environments possible. The combination of the L-shaped bonnet that can be tilted almost 90 degrees and the quick-release side panels provide easy access to engine components for servicing purposes. Operator’s comfort was also given a considerable amount of attention, with greater leg room incorporated into the new gen IC forklfits with its slim steering column design. Operators can easily adjust the seat to his or her needs and enjoy a healthy and fatigue-free stacker operation. The new model ranges feature an electric parking brake as standard, doing away with the previous handbrake lever in the cab. The operator simply presses a button to activate the brake. A new lifting mast design ensures improved view of the payload, forks and general working area. "Good all-round visibility is not only conducive to relaxed yet concentrated and safe truck operation, but also to higher handling turnover rates," Scheithauer says.